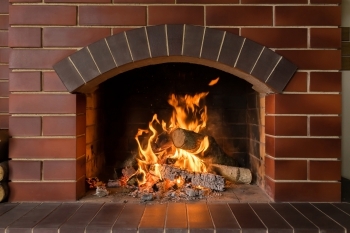 If cozy fireplaces warm your cold Colorado winters, here’s a hot question: Have you ever thought about what happens to your fireplace during the months it isn’t being used? During warm weather months, creosote—a build-up of tar and soot left over when wood burns—gathers along the sides of your chimney. Over time, this residue becomes flammable and could potentially ignite surrounding materials, like roof shingles. According to the U.S. Consumer Product Safety Commission, about 25,000 chimney fires cause over 120 million dollars in damage to property every year. As a franchisee for the most established home inspection company in North America, my team and I regularly see fireplaces that are not properly cared for. To avoid the risk of house fires and to keep your fireplace working properly, follow these simple steps. A qualified chimney sweep is trained to inspect your chimney for cracks and remove creosote build-up. How do you know if your chimney sweep is qualified? Look for professionals that have been certified with a reputable agency, like the National Chimney Sweep Guild or the Chimney Safety Institute of America. A chimney sweep will clear the inside of your chimney of creosote and other blockage. Then they will use a small scope with a camera to see inside the entire chimney, looking for cracks that could potentially cause fire hazards and other ventilation issues. They’ll also inspect the firebox to make sure the damper is working properly. All of these checks will prevent hot gasses from escaping and igniting the area surrounding your fireplace and chimney. What burns up must become ash. It’s a natural byproduct, but it can be a hassle to remove. So, most people don’t remove it. The problem is that too much ash can actually create bad airflow for future fires and potentially affect the quality of the air in the home. Prior to building that cozy fire don’t forget to clean out any build up ash in the box. As you use your fireplace throughout the cold weather months, remove ash consistently. The Chimney Safety Institute of America recommends having no more than a one-inch layer of ash on the floor of the firebox. This small amount of ash can help you build and maintain a fire, but any more than that can cause trouble. Fireplace doors are more than an aesthetically pleasing design element. They help control the draft and airflow of your fire. Test your fireplace doors to check they fully open and fully close. These two positions offer optimal air circulation as your fire burns. Fireplace doors also help your home become more energy efficient. Without doors, your fireplace is like a window that’s left open. Both warm and cold air throughout the year will be able to escape. Fireplace doors help make your fireplace operate more efficiently, so seal off this exit point and it will save you money. While your fireplace is in use, around 10 percent of the energy created from the burning logs is converted to useable heat for your home. Fireplace doors double this amount, radiating heat through the glass throughout the room. You should also have a screen in place to stop sparks from coming out into common areas when your fireplace doors are open. When winter is over, you can get a jumpstart on preparations for next year. Remove old ash and unburned wood from the fireplace. If you don’t, this can be a place for pests to spend their summer months. Downdrafts could also bring that old, wet wood smell into your home as the wood decays. By clearing all residual material from the fireplace after your last use, you’ll also be keeping moisture and buildup over the coming months to a minimum. Have additional questions or concerns? We’re here to help. My team and I are available for all your home-owning and home-buying needs. Click here to schedule your own home inspection (takes less than a minute to schedule! ), and we’ll be in touch.